Drawing of the inside of the brain showing the supratentorium (the upper part of the brain) and the infratentorium (the lower back part of the brain). 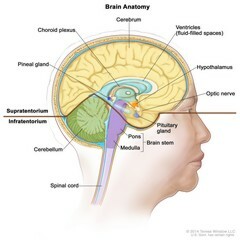 The supratentorium includes the cerebrum, ventricles (fluid-filled spaces), choroid plexus, hypothalamus, pineal gland, pituitary gland, and optic nerve. The infratentorium includes the cerebellum and brain stem (pons and medulla). The spinal cord is also shown.